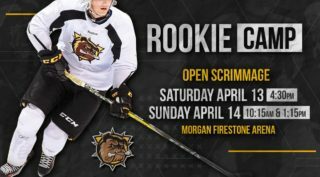 The 2019 OHL Priority Selection presented by Real Canadian Superstore will be held Saturday, an event that stands as the primary gateway into the Ontario Hockey League. Last year’s 2018 OHL Priority Selection featured a number of high profile names that went on to have productive rookie campaigns. Here’s a closer look at a few of those highlights. 64 GP, 29 G, 32 A, 61 PTS. 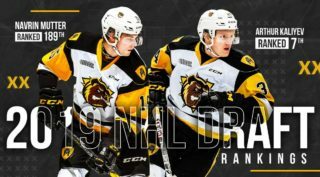 The first overall pick of last year’s OHL Priority Selection didn’t disappoint. Big 6-foot-5, 214Ib centreman Quinton Byfield scored 29 goals, the most by a Sudbury Wolves 16-year-old rookie since 1997. The Newmarket, Ont. native kept producing into the playoffs, excelling on a line alongside Nolan Hutcheson and Blake Murray as the Wolves won their first playoff series since 2013. 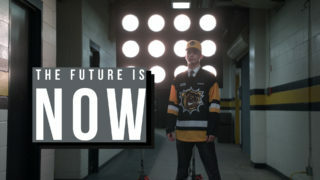 Already projected as a top prospect for the 2020 NHL Draft, the York-Simcoe Express graduate recorded three points or more five different times this season, scored five game winning goals and held his own in the faceoff circle, winning 52% of his draws. Polarizing pair leads the pack ? 60 GP, 6 G, 21 A, 27 PTS. The 2018-19 season got off to a slow start for Evan Vierling and everyone in a Firebirds uniform, but the Aurora, Ont. native finished strong, compiling 20 of his 27 points after the turn of the new year. A Minor Midget teammate of Byfield’s, Vierling helped the Firebirds finish the season on a high note as they earned 11 of their last possible 16 points. The 16-year-old collected points in five of his last six games to end the season. Worth the wait to see this one ? 63 GP, 26 G, 15 A, 41 PTS. Big 6-foot-2, 200Ib winger Will Cuylle wound up in Windsor to begin his OHL career, putting up 26 goals in his rookie season, the most by a Spitfires 16-year-old since Taylor Hall back in 2007-08. The Toronto Marlboros graduate netted his first OHL hat-trick on Jan. 3rd against Sudbury and developed some late season chemistry alongside fellow rookie first rounder Jean-Luc Foudy. Cuylle led the OHL’s rookie class in shots on goal with 187 on the season. 63 GP, 7 G, 33 A, 40 PTS. Last year’s GTHL Player of the Year, fleet-footed defenceman Jamie Drysdale made his mark in Erie, setting a new single season franchise record for points by a rookie defenceman. The 5-foot-11, right-hand shot put up 17 of his 40 points on the power play and saw time in all situations under head coach Chris Hartsburg. Some of Drysdale’s season highlights include wearing the ‘C’ for Team Canada Black at the 2018 World Under-17 Hockey Challenge where he recorded four points in five games. The Toronto Marlboros grad scored an overtime winner on Feb. 15th in London and put up three different three-point efforts over the course of the campaign. 63 GP, 37 G, 37 A, 74 PTS. Cole Perfetti put up one of the more dominant 16-year-old seasons in recent OHL history, setting a new Saginaw Spirit single season rookie record with 37 goals. The Whitby, Ont. native finished tied for the Spirit scoring lead with 74 points as they captured their first West Division title since 2011. Perfetti was a common sight on highlight reels throughout the season, using his great vision and quick release to give the Spirit an added offensive edge. He led OHL rookies in points and game winning goals while finishing with the second-highest plus/minus rating of plus-36. The Vaughan Kings graduate became the league’s first rookie in his 16-year-old season to score four goals in a game since 2008-09, lighting the lamp four times on Mar. 9th in London. 63 GP, 8 G, 41 A, 49 PTS. Toronto Titans graduate Jean-Luc Foudy led OHL rookies with 41 assists, using his speed to create time and space for his teammates. The Scarborough, Ont. 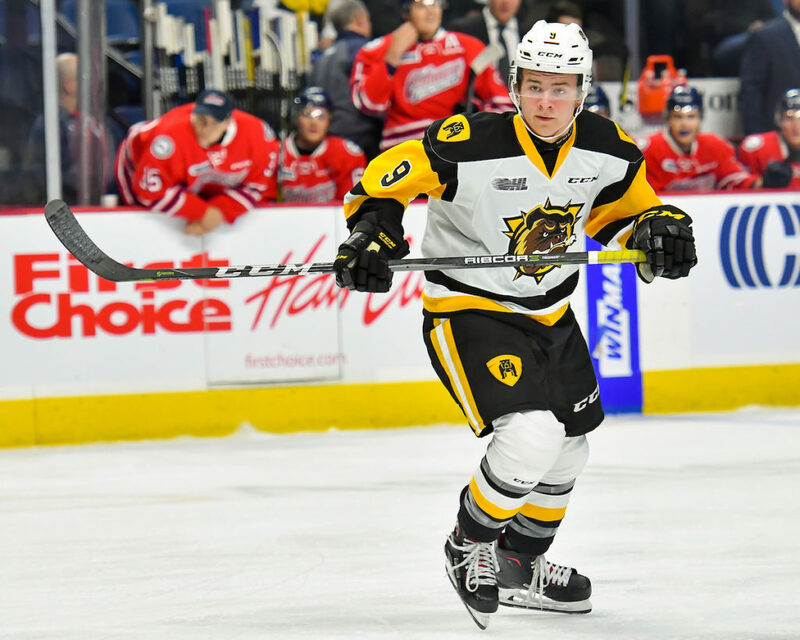 native had the opportunity to line up against older brother and Columbus Blue Jackets prospect Liam Foudy of the London Knights in the first round of the OHL Playoffs. Foudy’s season highlights included a nine-game point streak from Dec. 16th to Jan. 11th, one that saw him record an assist in each of those contests. He collected a season-high four assists on Jan. 17th against Erie and closed out the regular season with his first multi-goal performance on Mar. 15th in Sarnia. 60 GP, 15 G, 27 A, 42 PTS. Oshawa Generals winger Ty Tullio enjoyed a productive rookie season, finishing the year with 27 points (8-19–27) over his final 25 games. The Vaughan Kings graduate has continued to put up points in the playoffs, recording four points (2-2–4) in Oshawa’s five-game series win over the Peterborough Petes. Tullio has kept up with talented veterans this season, seeing time on the power play under first-year Generals head coach Greg Walters. The soon-to-be 17-year-old from Lakeshore, Ont. suited up for Team Canada Black at the 2018 World Under-17 Hockey Challenge. 47 GP, 14 G, 20 A, 34 PTS. After two seasons of Minor Midget at over a point-per-game, Logan Morrison‘s offensive prowess was no secret. It took the 16-year-old some time to get going before finishing his season with 28 points (12-16–28) over his final 31 games post-January 1st. The Guelph, Ont. product registered eight different multi-point outings in his rookie season and saw time on the club’s top power play unit in the postseason. 63 GP, 30 G, 25 A, 55 PTS. 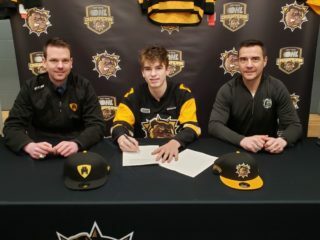 Jacob Perreault became the first Sarnia Sting 16-year-old rookie to hit the 30-goal plateau since Alex Galchenyuk in 2010-11. Perreault wasted little time, scoring twice in his OHL debut on Sept. 22nd in Saginaw. He ended the season fourth in OHL rookie scoring with 55 points (30-25–55). After leading the HPHL’s U16 division in scoring last season, Perreault picked up where he left off, potting a team-leading five game winners while also suiting up for Team Canada Red at the World Under-17 Hockey Challenge. The son of former NHL forward Yanic Perreault, Jacob gave Sting fans a glimpse of what they can expect in his sophomore season. Can’t hold back @JPerreault_44 ? 62 GP, 8 G, 14 A, 22 PTS. Joining Perfetti and Tullio from the Vaughan Kings’ graduating class of 2018, blueliner Ryan O’Rourke didn’t disappoint in his first OHL season, finishing with 22 points (8-14–22) on a highly successful Greyhounds squad. Perhaps O’Rourke’s most impressive play came at the World Under-17 Hockey Challenge in Saint John and Quispamsis, New Brunswick where he recorded six points (3-3–6) over five games with Team Canada Black. O’Rourke led blueliners in tournament scoring and was named to the event’s all-star team. The 6-foot-2, 175Ib Pickering, Ont. native came out of the gate fast with points in each of his first three OHL contests. Congrats to #CHL tournament top performers @mcclennon_94 of @WHLKootenayICE and @rorourke8 of @OHLHoundPower. 66 GP, 13 G, 21 A, 34 PTS. The first pick of the second round, American-born winger Antonio Stranges brought a fair bit of flash to the London Knights lineup this past season. Stranges heated up nearing the midway point of the season, entering the holiday break with points in six of seven. He recorded a season-high three assists on Feb. 13th in a 6-1 win over Guelph. Keep an eye on Stranges, whose speed and vision will have NHL scouts on high alert next season. The @GoLondonKnights stay hot ? The first goaltender chosen last spring, Saginaw Spirit netminder Tristan Lennox made the list with a strong rookie showing. The late 2002-born puckstopper has a bright future ahead of him after passing his first OHL test on a Spirit team that won a record 45 games. The Mississauga Reps grad posted his first OHL shutout with a 23-save performance on Dec. 30th against the Flint Firebirds. Lennox, who hails from Cambridge, Ont., won’t be eligible for the NHL Draft until 2021. Just a reminder that Tristan is 5-1-1-1, 2.57 GAA with a 0.906 SAV% this year. Oh ya, he doesn’t turn 17 till October. 64 GP, 18 G, 8 A, 26 PTS. A big 6-foot-4 power winger from Ottawa, Ont., Cameron Butler showed a knack for goal scoring in his first OHL season. The York-Simcoe Express graduate netted 18 goals, the most by a Petes 16-year-old since Matt Puempel in 2009-10. Butler missed the postseason with a bout of mono, but Petes fans can expect the big shooter to be back in full force come September.